The boys arrived safely--YAY! Cam's plane from London came in at the same time as two planes from Riyadh full of pilgrims returning from the Haj. Many people were still wearing the white robes of the Haj. There were quite a few women pilgrims, one sticking in my mind, a lady who just semed to glow. The Beirut Moores are off on a flurry of travel. First I get to take B and C around Lebanon some this week while T is still in school: Tyre (Sur) in the south, Baalbek in the east and Byblos to the north. Then we are off to Aleppo, Syria (hopefully--we hear Americans may have trouble at the border) and on to Turkey and eventually to Greece. That is the plan. A marvelous thing: I noticed (at our fancy health club, of all places) a creche scene under a Christmas tree that looked fundamentally different than we see in the States. It was a papier mache-type creation, but not our typical manger scene. But there were the wise men, animals, baby Jesus. I realized it was meant to be a cave. Caves are stables here, or can be. 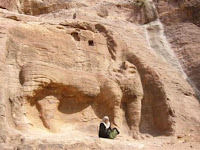 Tom points out how often we have seen livestock housed in caves in the Middle East. I think of all the Christians, and others, over time who have taken refuge in the caves lining the valleys in this part of the world. We bought a cheap plastic Bethlehem scene featuring camels. Ah the plus-es of working at the American Community School in Beirut. Last week Tom got two days off for American Thanksgiving. Next week its three days off for Eid al Adha. This Eid (as opposed to Eid el Fitr, the one that ends Ramadan, or, for that matter, Eid il Milead, Christmas) celebrates Ibrahim’s/Abraham’s willingness to sacrifice his son. Allah/God intervened and provided a ram instead, and for Eid al Adha some Muslims and Druze kill a goat or sheep and share the meat with family, friends and the poor. 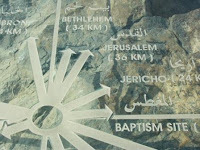 It is also marks the end of the Haj, the pilgrimage to Mecca that the devout make once in a lifetime if they are able. Flew into Amman and were met by a man named Said holding a sign “Kristine and Mr. Moore”. He led us to the rental car we had booked online. 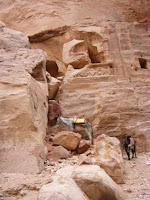 Off we went, heading f or Petra. 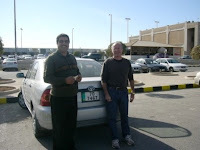 Photo: Said, Tom and car outside Queen Alia International Airport. meters (1300 feet) below sea level. It is six times saltier than the ocean, is shrinking at a fairly alarming rate--it has gone down 12 feet in just five years, attributed to diversion of the Jordan River for agriculture, a decrease in annual rainfall, and chemical plants at the south end of the Dead Sea. 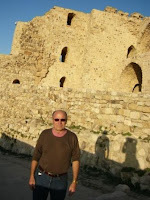 Next stop: Krak, a Crusader and Mamluk castle built in 1142, in a city mentioned several times in the Bible as Kir. Reynaud de Chatillon was the sadistic leader there, and had the distinction of being the only crusader leader to be executed by Saladin. Old Reynaud would have wooden boxes fitted around people’s heads before flinging them off the 450 foot high castle, so they would experience the fall in a conscious state. Back to the car and heading south, on the King’s Highway. Low Bedouin tents against the dirt hills. 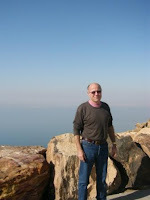 What we’d planned to be a 3 - 4 hour drive became 9, what with the Dead Sea diversion and a couple of unexpected detours. 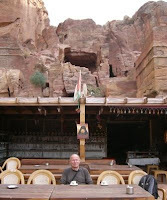 Tom managed well, and we made it into Petra about 7 pm. It was Thanksgiving Day. The Amra Palace Hotel, mostly package tourists, but very nice. 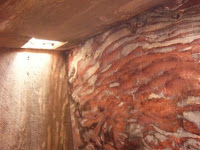 Tom indulged in the hamam (Turkish bath) experience one night (says he’s never been so clean). But it faced a good sized mosque that, at 4:30 am blared out Allah Akbar in song, not once but three times, about 10 minutes apart, just as one drifted back to sleep. It was Friday, Moslem worship day. Speaking of Allah, I noticed the Royal Jordanian Airlines pilot start his inflight announcement with three “Allah Akbar”s (God is Great). 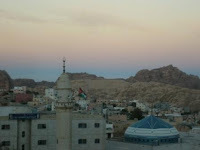 Photo is the mosque from our hotel window. 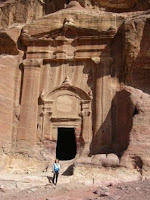 Petra--monumental is the word. Pink sand underfoot. 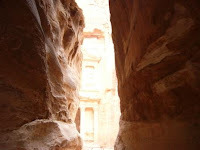 Towering stone, much of it carved by ancient Nabateans into remarkable shapes. 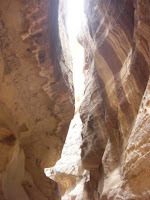 You walk down a ¾ mile long 6 - 16 foot wide path (the Siq; you know it from Indiana Jones) lined with huge slabs of rock 100 - 200 feet high the whole way. 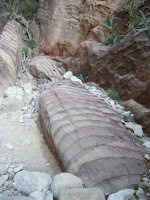 Traces of 2000 year old terracotta pipes running the length of it is, still in place. 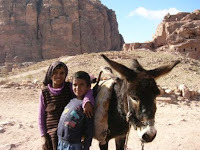 There a quite a few tourists here, unlike sites in Lebanon, donkeys and carts carrying some of them along. 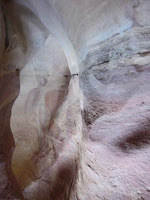 The Siq ends dramatically at the Treasury, carved from the facing stone by Nabateans somewhere between 100 BC and 200 AD. It is 140 feet high. 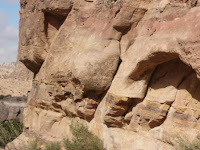 Those clever Nabateans. They got rich from the camel caravans that passed by, carrying frankincense, myrrh and spices from Somalia, Ethiopia and India. They offered logistics, banking, product processing and fresh animals before the goods went on their way across the Sinai to ports in Gaza and Alexandria, to be shipped to Greece and Rome. They coexisted with the Romans, until they chose to ally with one of their foes, and were eventually invaded by Herod the Great. 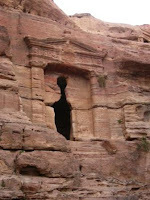 And increased sea trade began to bypass Petra. 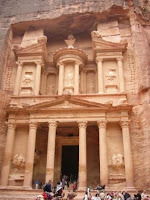 In AD 106 the Romans took Petra. 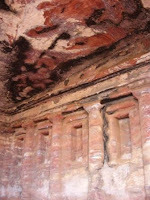 They cut through some stone tombs to enlarge the theater. 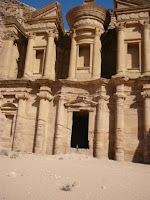 During the Byzantine era some Nabatean buildings were turned into churches. 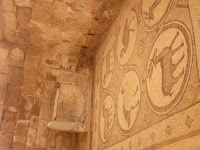 Here are some Byzantine mosaics in Petra Church. Above, Gnarlo the donkey, and friend. After the famed Treasury we stop of tea with mint (me) and coffee with cardamom (T), some Bedouin guys sitting at another table start to play Bob Marley, hero the world over, on their MP3 player. “No woman, no pride”, with a kid on a donkey standing next to their table. Tourists on camels pass by. Boys with arms laden with necklaces, “1 dinar, 1 dinar,” ($1.50) they call. Hey Grimstads--how about them Husky colors! 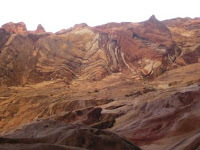 Next day, the incredible Wadi Muthlim trail, with its 88 meter (almost 300 feet) tunnel, a yard wide in spots, 300 - 400 foot curving rock walls of assorted impossible hues and shapes--one photo-worthy, astonishing sight after another. 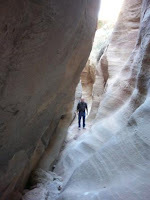 At the end of the tunnel, an open area, and a Bedouin family sitting along side the trail wanting to sell us tea. 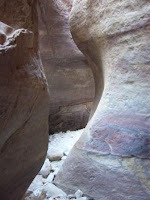 Continuing the walk along a wide valley floor, rock sides dotted with Nabatean tombs. 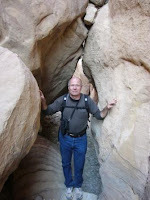 In two days in Petra we also hiked to the High Place of Sacrifice and the Monastery, with views over the Palesitnian Territories, the Negev with Egypt beyond. 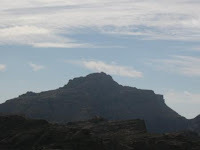 Here is Mt. Hermon. We found people so kind and welcoming. Even in tourist destination Petra, the Bedouin, at least some of whom live in caves and who everyday take hordes of rich tourists on donkey and camel rides, even these people are welcoming: as we chose a fork in the trail from the Royal Tombs, a guy on a camel on a nearby but not immediately adjacent hillside called out to us that it was the other trail we wanted. Jordan has such a different feel from Syria to the north, conservative but more modern, a little richer, less controlled at least politically. Not nearly as cosmopolitan or as green as Lebanon. Lots of men in suits, even in what we might consider menial jobs--the money exchange guy, some shopkeepers. Houses are square, solid and simple looking. There is nowhere near the level of roadside trash as Lebanon. We never did go into Amman, just got the car and headed south. Amman doesn’t hold great appeal. My impression of Jordan is that it is largely flat and brown, but with spots of extreme interest, and with lots of friendly, laid back people. In the airport we were surprised to see some women workers in uniform.